Hi ladies, Radio One's Big Weekend on the bank holiday officially opened the festival season and it is time to get our cute floral headbands and 70's inspired fringe accessories out. 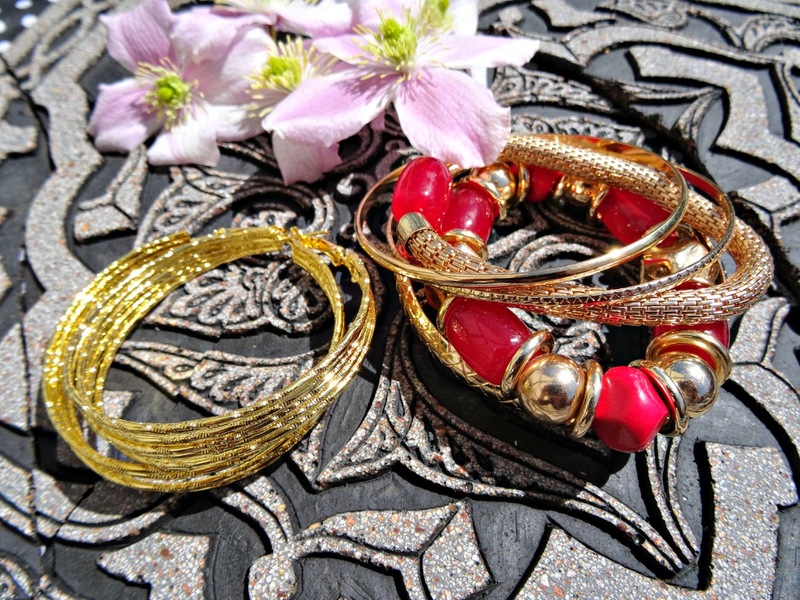 With regards to jewellery, Aztec remains a must-have for me and in today's post, I'd like to show you some of my picks that I'll be taking with me to the upcoming Glastonbury Festival. I was recently contacted by Touchstone, a company that supplies High Street retailers such as Select, New Look or Debenhams with fashion jewellery. My special package contained some super sparkly treats such as gold bangles and geometric necklaces which I'm going to show you now in more detail. Gold is a massive trend colour this summer and these bangles are super sparkly. They fit nicely around my wrist and they are adjustable, so they can also be worn by people with smaller wrists. The red bead stretch bracelet pack on the right are fun, too as you can play around with the stack and create various combinations on how to wear them. Teamed up with a white shirt and blue jeans shorts, these make great arm candy. 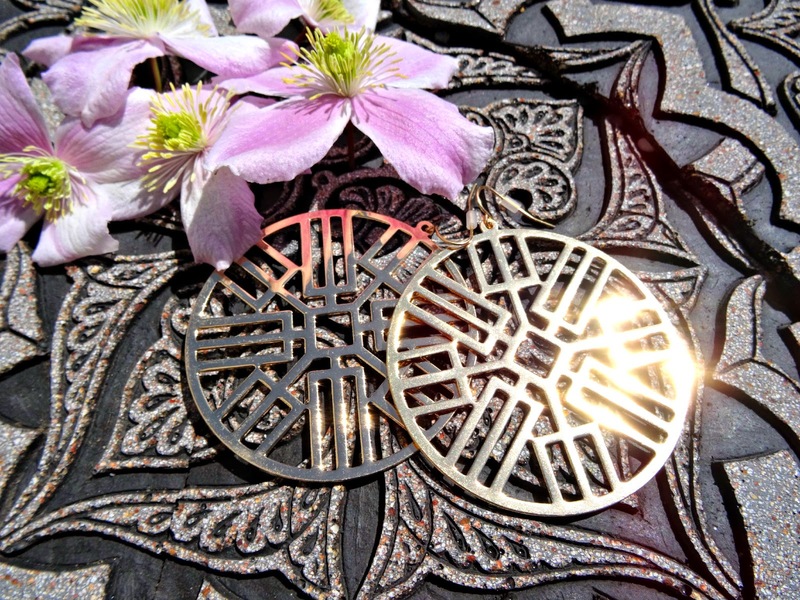 These oversized Aztec earrings scream festival all over. Made of light-weight metal with a gold finish there's a fantastic eye-catching effect when they get hit by sunlight. 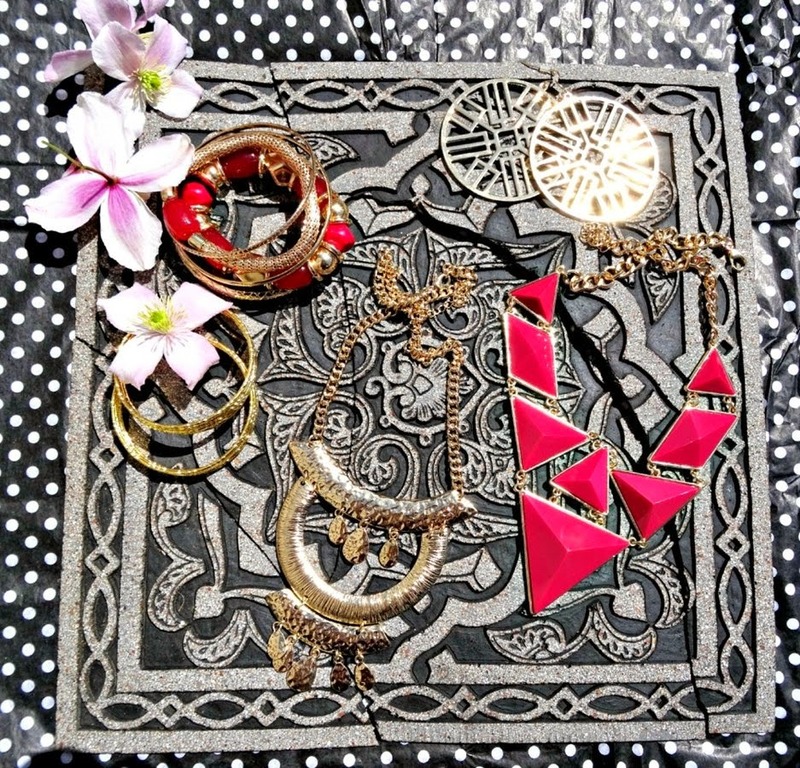 They are statement earrings and quite loud, so not necessarily suitable for everyday use, but teamed up with a black summer tunic a true festival stunner. If you've been reading my blog for a while, you would have seen my addiction to jewellery and I posted a few reviews of new brands such as Karma review and some amazing statement pieces by Orelia and Rara De Barr jewellery recently. To me, the statement jewellery trend can stay as long as it wants to, as I love pieces that speak for themselves and glam up effortlessly basic outfits in an instant. 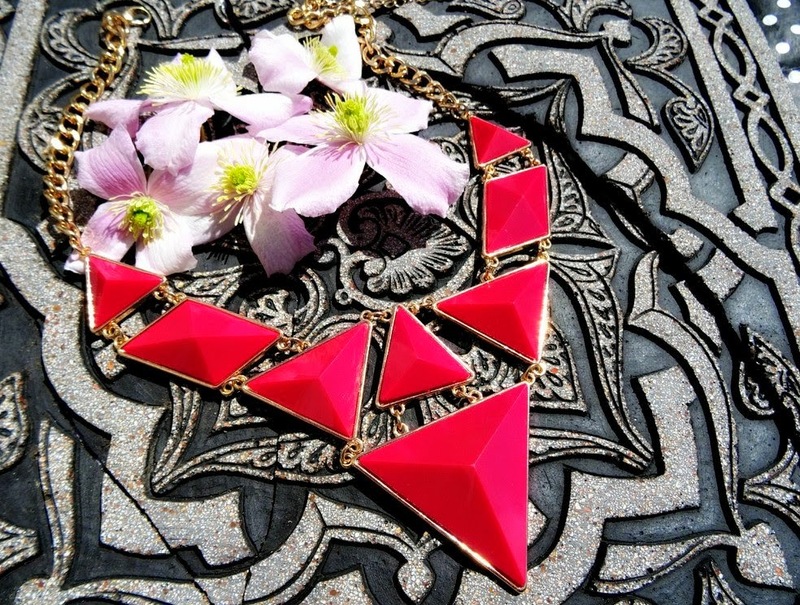 This geometric necklace features a gold finish with plastic 3D tetrahedrons which create an eye-catching effect when hit by sunlight. The bright colour reminds me of summer and having a good time so it'll come with me to Glastonbury. I got really excited when I found this golden Aztec inspired statement piece in my package. The gold look is so shiny and the necklace is of great material given the fact this is only metal. I love the entire design and style of it and used it for my Glastonbury Day 2 Outfit, as it works super well with green shirt dresses. Thank you so much for reading today's post. Are you going to any festivals this year? 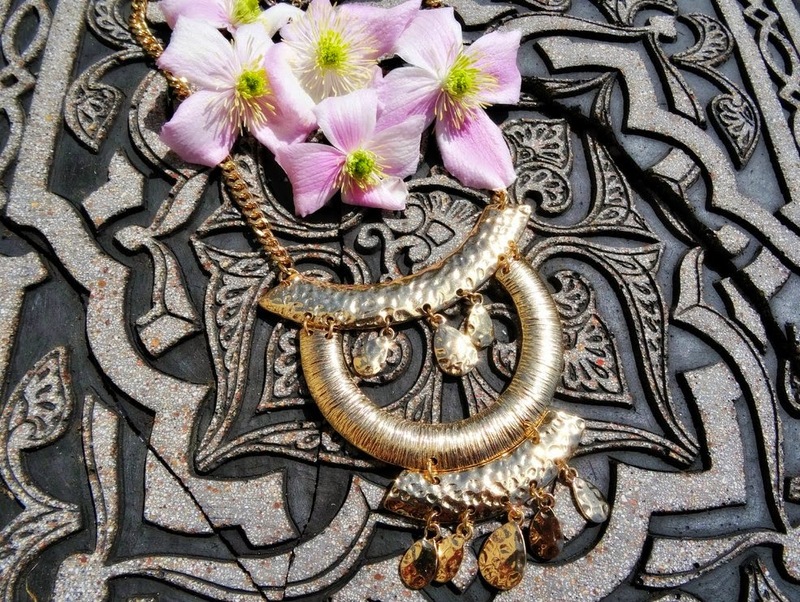 If so which ones and which jewellery pieces do you take on your trip? What is your all time festival piece?